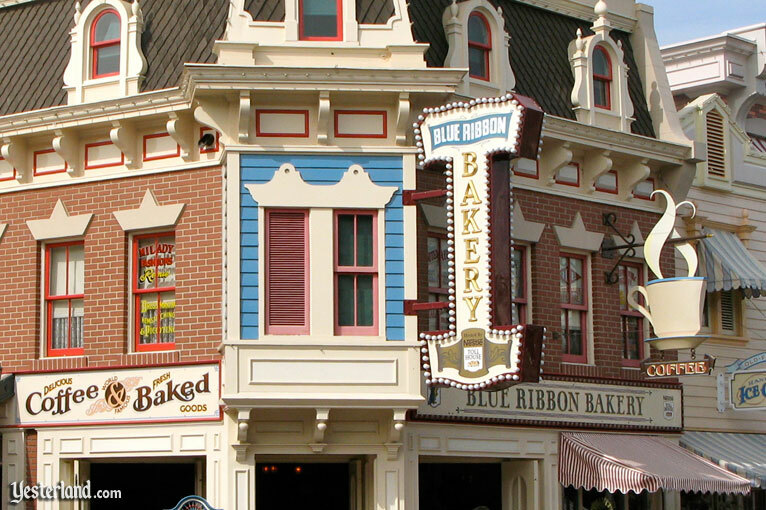 When it’s morning at Yesterland and you want coffee and a buttery pastry or melt-in-your-mouth muffin, just head halfway up Yester Main Street, U.S.A. to the Blue Ribbon Bakery. 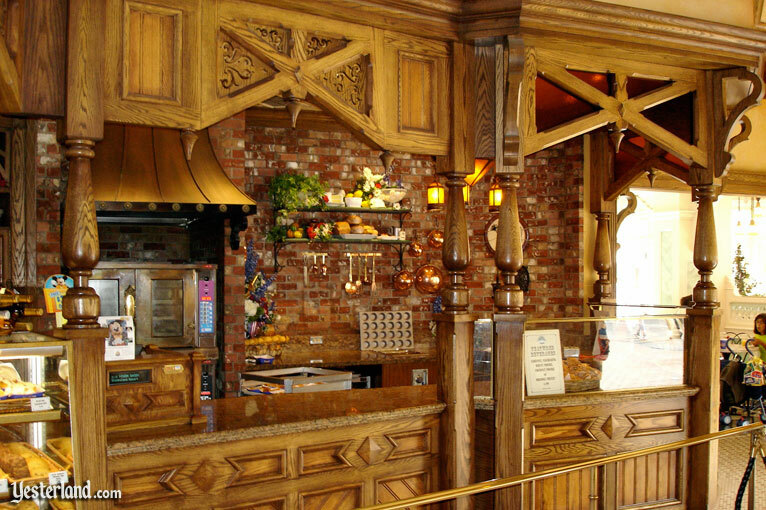 Later, come back for lunch and try a Smoked Ham Sandwich, Turkey Sandwich, or Three Cheese Vegetable Medley Sandwich. 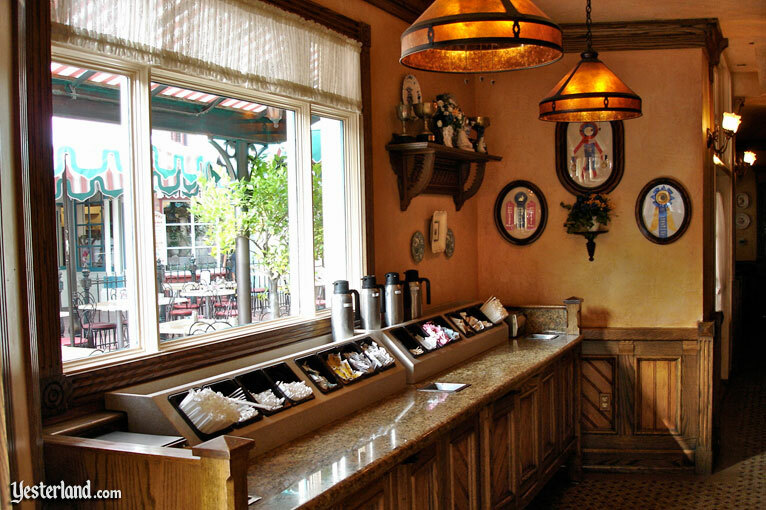 Then, any time is good for a Matterhorn Macaroon and your favorite hot or cold beverage. In the late 1800s, a talented baker and his wife left their small European town to pursue a new life in America. In no time, his tasty treats became well-known throughout the town, and his friends convinced him to enter the 1901 State Fair. He was awarded first prize—a blue ribbon—in three of the four categories (the judge’s mother-in-law won first place in the fourth category). He also won enough prize money to realize his lifelong dream—his own bakery: The Blue Ribbon Bakery. 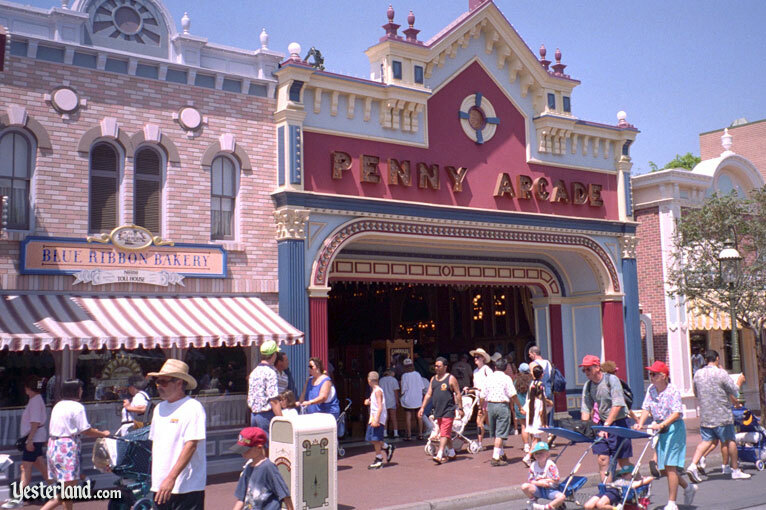 Remember, here on Yester Main Street, it’s just past the turn of the 20th century, so these events happened in the recent past. Well, to tell the truth, it’s a fictitious story—but now the bakery’s name makes sense. As the Blue Ribbon grew in popularity, the enterprising baker added another European tradition to his shop—a small European-style café, with comfortable tables and chairs. The name for the café was provided by his wife whose love for the sweet fragrant carnations was legendary: To help create a pleasant European atmosphere, she planted carnations in the window boxes surrounding the outdoor dining area. 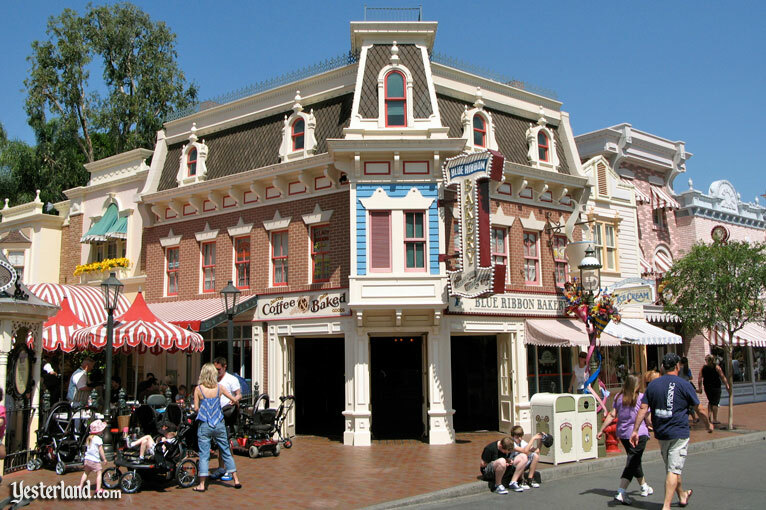 If you want a restaurant named after the Carnation Company dairy, you’ll have to go to Yesterland’s original Carnation Ice Cream Parlor and Restaurant. Let’s go inside the Blue Ribbon Bakery. It’s the beginning of the 20th century here on Yester Main Street, but the Blue Ribbon Bakery caters to the end-of-the-20th-century Starbucks generation. It’s one of those places where you don’t just ask for a cup of coffee. You have choices: Espresso, Cappuccino, Cafe Latte, Cafe Mocha, Blended Mocha, Caramel Machiatto, White Chocolate Mocha, Orange Frappe… and traditional Fresh Brewed Coffee. Then, there are more decisions to make. Do you want a single or double shot of espresso? Regular or decaf? Hot or cold? Tall or grande? Added flavor, such as almond, caramel, cinnamon, hazelnut, Irish cream, raspberry, or vanilla? 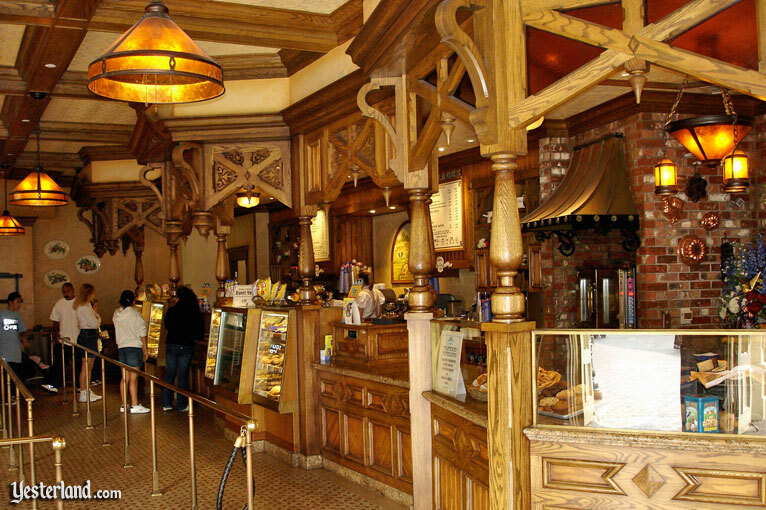 It’s almost like one of those Starbucks that you find in the real world, but never at a Disney park. The interior is dark wood and polished brass. It’s quite different from some of the Victorian interiors nearby, but it’s also appropriate for the era. Large bakers’ display cases tempt you with cookies, sticky buns, pecan rolls, and other calorie-laden indulgences. Hey, it’s okay. You’re on vacation. If you’re at the Blue Ribbon Bakery during the Christmas season, go in for a seasonal treat. How about a Pumpkin Muffin or a Gingerbread Cookie? Want something with red and green sprinkles? Then have a Holiday Biscotti, Holiday Shortbread Cookie, Holiday Cupcake, or Holiday Brownie. If you want to take home a souvenir, splurge on a Holiday Demitasse Dessert Cup—a ceramic Mickey Mouse cup with chocolate mint mousse, whipped cream, and a shortbread cookie. From the other side of Main Street, U.S.A.
During the Holidays, there are even more beverage choices. Choose from Pumpkin Spice Latte, Peppermint Mocha, Hot Spiced Apple Cider, Eggnog Latte, and Eggnog. Now aren’t you glad that the talented baker and his wife immigrated to the United States and opened the Blue Ribbon Bakery? 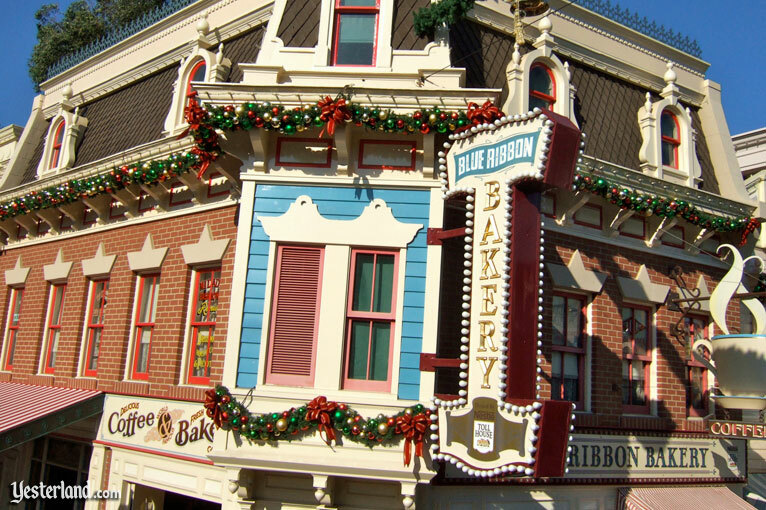 The first Blue Ribbon Bakery at Disneyland opened in 1990, replacing the Sunkist Citrus House. 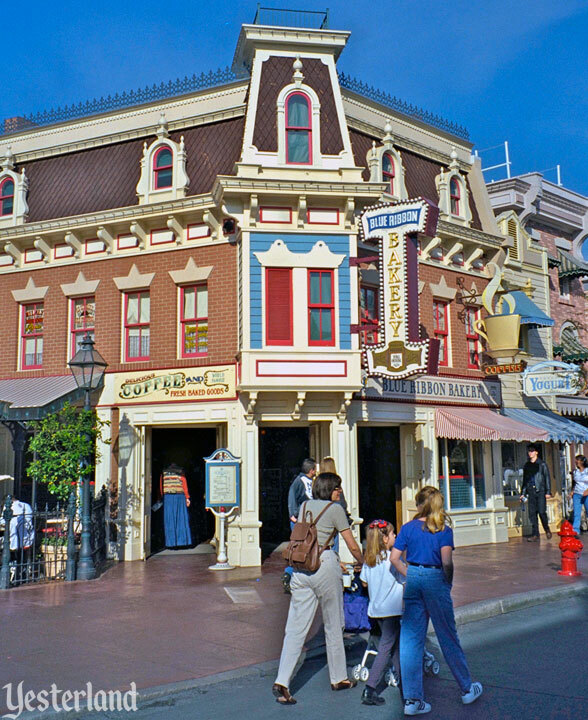 This location became Gibson Girl Ice Cream in 1997. 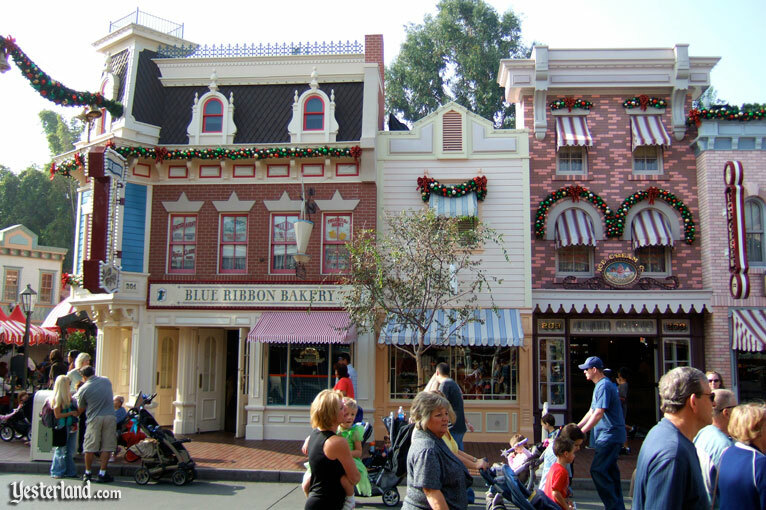 The second Blue Ribbon Bakery—the one featured in this Yesterland article—opened in mid-1997 next door to the earlier Blue Ribbon Bakery. 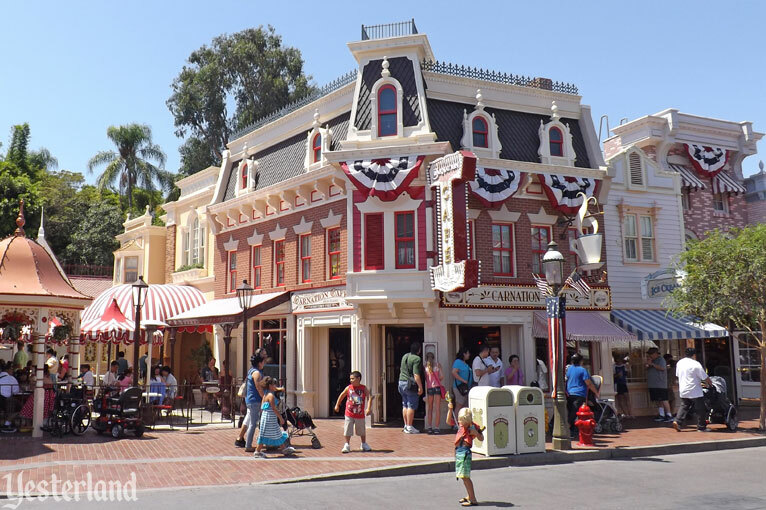 It took over the space that had been the Carnation Ice Cream Parlor and Restaurant at the corner of Disneyland’s Main Street and West Center Street. 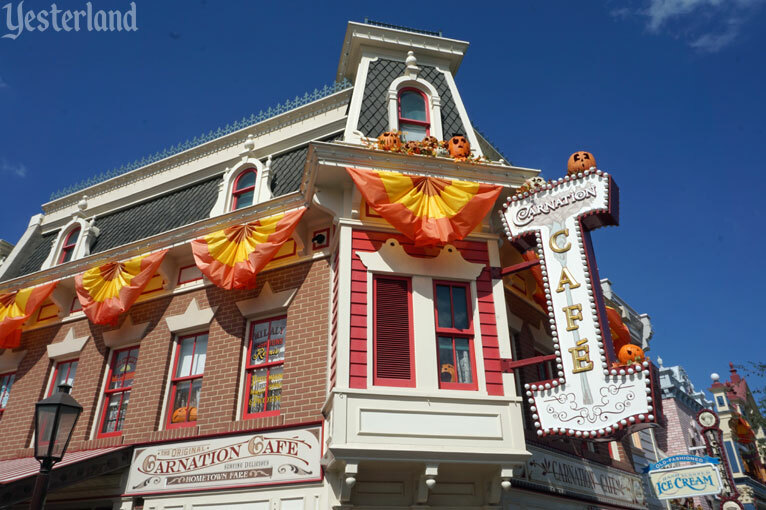 Carnation survived as the Carnation Café, with outdoor seating only. The bakery moved again in early 2012—or, more accurately, a new bakery replaced it. 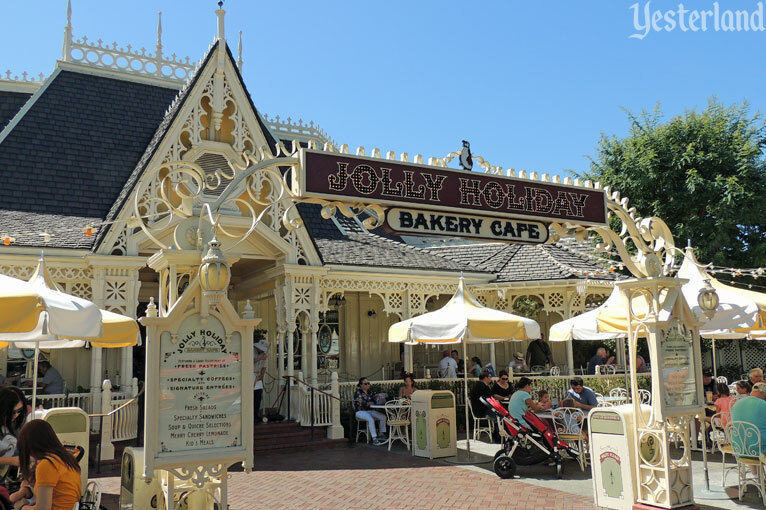 The Jolly Holiday Bakery Café opened in the location that had been the Plaza Pavilion annual passport processing center. 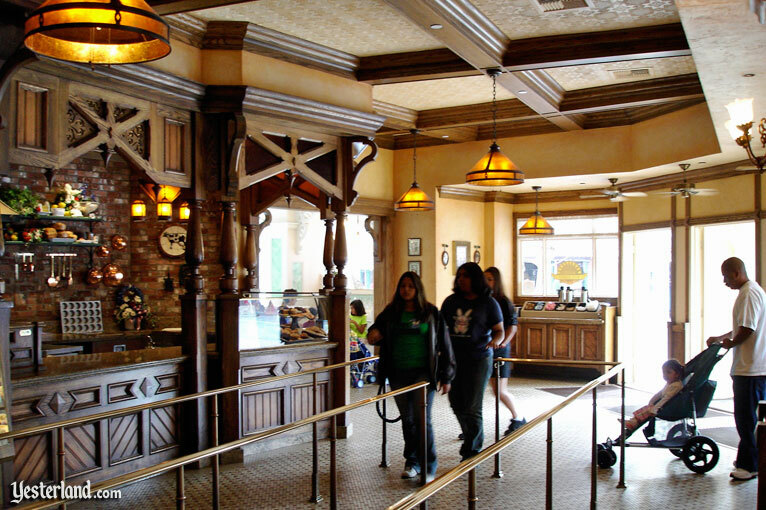 In mid-2012, the second Blue Ribbon Bakery space became the new Carnation Café, adding indoor seating back to the café and returning the Carnation name to the outside of the building. 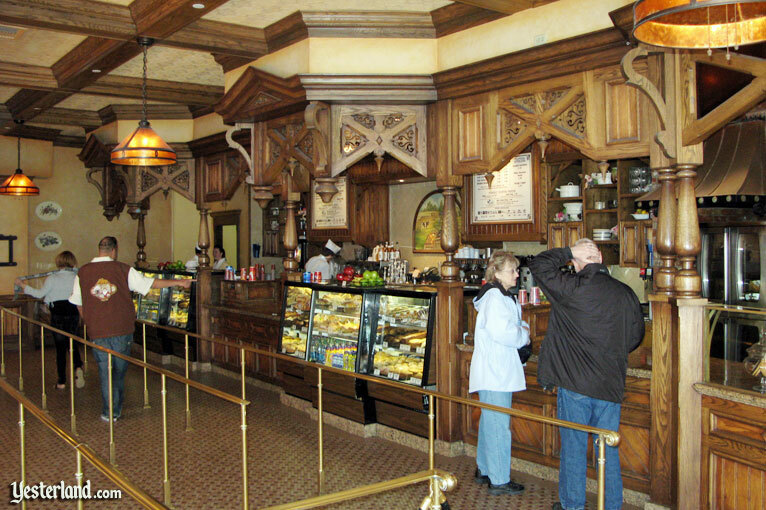 Guests who liked the Blue Ribbon Bakery’s fancy coffee drinks had a new place for such beverages when the renovated Main Street Market House became an in-park Starbucks in 2013. 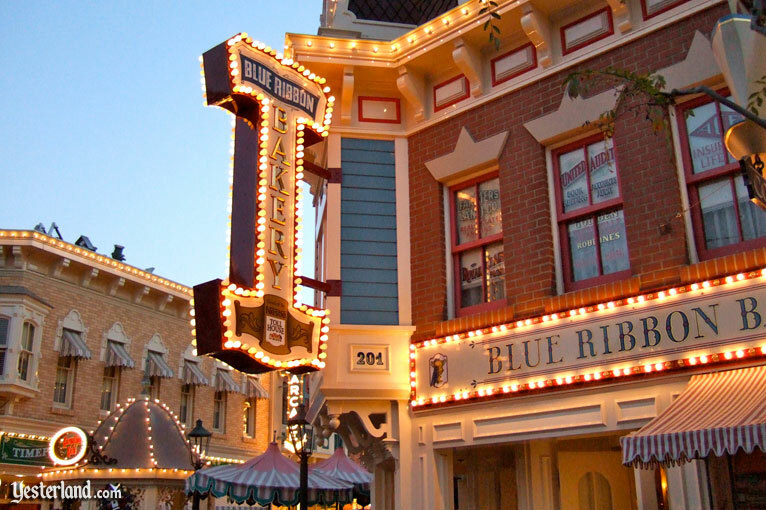 Author Sam Gennawey found the backstories (earlier in this article) about the award-winning baker and his carnation-loving wife in an issue of the cast member periodical Disneyland Line, published March 14, 1997, before the opening of the new Blue Ribbon Bakery and Carnation Café. Disneyland has kept using the Carnation name, a tradition that went back to the 1955 opening of the park. But it now just refers to the flower, not the defunct Carnation ice cream brand.